“Cooking Experience”, was founded in 2008 by the love and passion of Gianna Greco for her homeland and its valuable resources, with the aim of transferring her knowledge about culture, history and traditions through local food and wine. The school is located in Corte dell’Idume, in the heart of Leccese Baroque, where it is said, since 500 flowed the river from which it takes its name. Among ancient stones and ancient vaulted ceilings, in a harmonious environment, we also find a cave in the shape of inverted cone,which it was used in the ancient times for the collection of rainwater, today is our “Cantina Meditativa”used to taste wine and sing together. Gianna desire is to blend flavors and traditions with skill and empathy where those who choose to prepare a dish aspires to assess their essence through real and unique moments. Learn the secrets of Salento cuisine and prepare delicious meals thanks to our “hands-on” cooking classes. 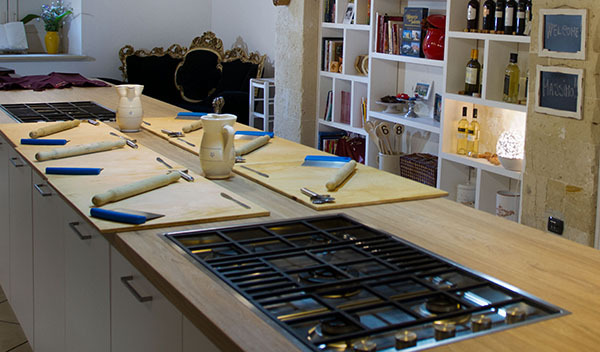 Guests from all over the world come to Cooking Experience to enjoy an unforgettable experience. Gianna is happy to share with them many recipes and techniques for the preparation of many of the most traditional dishes of Salento, which will satisfy even the most experienced gourmets. When you add these well-tested recipes to your collection, it will be like to take home a piece of culinary Apulian history! It will prepare a healthy, authentic Salentino’s meal, using the finest local and organic ingredients, which vary according to the season. The classes are limited to small groups of participants and everyone can try new techniques, make fresh pasta and enjoy a glass of local wine. The course will be taught in English and each lesson will last for approximately 3 hours and will follow an Italian family-style meal with local wine tastings. Our chef always pays more attention to the special dietary needs of our guests, such as vegetarian, vegan, macrobiotic, gluten-free, or anti-allergic menu. Guests who do not want to cook are invited to accompany the chefs (as the meal is prepared can relax in the garden or enjoy a leisurely stroll through the historic center of the city) and then join the dining table. Upon request, the lessons can be held in your villa or residence in Salento, or the school may organize a special course in your town, wherever you are.